I love this time of year. The weather is getting warmer and the variety of fruits and veggies is expanding by the minute. What’s not to love about that?? This means fruit salads, more smoothies, fruit inspired dressings and maybe some sangria when this 60 day challenge is over. Say hello to almost summer! Strawberry season is here. With the month of May approaching two days away, so is the presence of strawberries at the farmers market. I can’t wait to create some recipes for you to try. I often hear some “diets” that call for no fruit but unlimited amounts of meat?? What the heck? If you are working out on the regular and burning this natural sugar off then it should’t cause your blood sugar to spike. Eat real foods, in moderation. Bottom line. And most importantly EAT ORGANIC! 1. One cup of sliced strawberries provides 163% of your daily dose of vitamin C (more than an orange) and 12% of your daily amount fiber. 3. Anti-Inflammatory. Strawberries fight against many inflammatory disorders, such as osteoarthritis and asthma. 4. Anti-Cancer. The combination of antioxidant and anti-inflammatory agents found in strawberries is well known to fight against the onset of many different typed of cancer. Vitamin C, folate create a defense against any potential cancerous cells. 5. Manganese. One cup of strawberries contains 21% of manganese (an essential nutrient that acts as a powerful antioxidant and anti-inflammatory agent). Manganese is also great for your bones both with helping bone building and maintaining bone structure. So, now you know. Get to your local farmers markets where farmers practice sustainable farming practices. 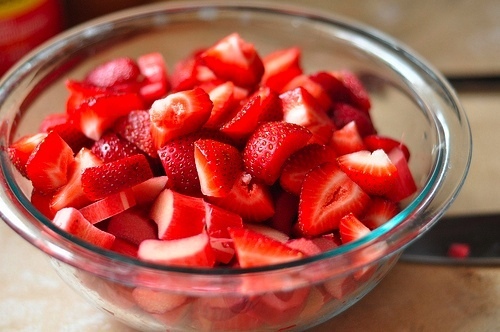 Also, If you have any favorite recipes that include strawberries send my way! !